During adolescence (e.g. 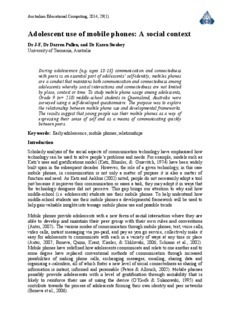 ages 13-­‐15) communication and connectedness with peers is an essential part of adolescents’ self-identity; mobiles phones are a conduit that maintains both communication and connectedness among adolescents whereby social interactions and connectedness are not limited by place, context or time. To study mobile phone usage among adolescents, Grade 9 (n= 218) middle-school students in Queensland, Australia were surveyed using a self-developed questionnaire. The purpose was to explore the relationship between mobile phone use and developmental frameworks. The results suggest that young people use their mobile phones as a way of expressing their sense of self and as a means of communicating quickly between peers.